The following are web site links to help you find a marriage counselor. 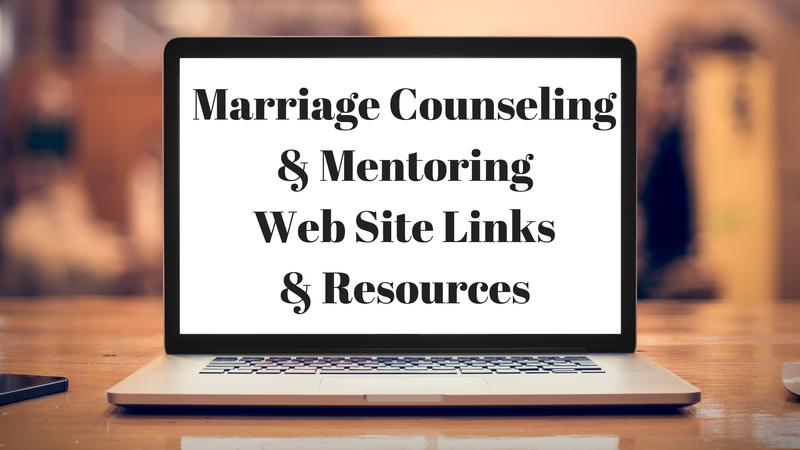 Additionally, we provide marriage mentoring links to web sites that can help you to become a marriage mentor. We also list several recommended resources that can help you in mentoring situations. We pray you will find them to be helpful. • Focusministries1.org This is a not-for-profit organization devoted to offer hope, encouragement, education, and assistance to women who are struggling in difficult circumstances. This includes spousal abuse. FOCUS Ministries provides help for women suffering the horror of domestic violence. They also assist those who want to help. You can contact them at: FOCUS Ministries P. O. Box 2014, Elmhurst, Illinois 60126. Their phone number is: (630) 595-7023. There is also FOCUS Ministries, P. O. Box 323, Hanson, Kentucky 42413. Phone: (270) 825-2423. If this is not an emergency and you would like to reach FOCUS Ministries, you may contact them through their web site or by e-mail at help@focusministries1.org. • FOCUS ON THE FAMILY COUNSELOR LOCATOR: Focus on the Family has developed a nationwide Christian referral system. As they say on their web site, “Our counseling staff would be happy to speak with you. We can recommend any counselors available in your geographic area.” If you live in the U.S. you can do the following: “To speak with a counselors’ assistant and receive a referral to a counselor in your area, please call (719) 531-3400 from 9-4:30 (Mountain Time) Monday through Friday. Ask for the Counseling department. To find a counselor in your area of the United States please go to their Counselor Locator. Unfortunately, they do not have area counselor referrals outside of North America.” However, they DO have web sites for a variety of other countries such as Australia, Canada, China, Costa Rica, Ireland, Malaysia, Singapore, South Africa, and Taiwan, which may be able to direct you to counselors in your area when you contact them. • Focus on the Family – South Africa Their primary objective is to meet the needs of families through reliable and trustworthy resources, counseling support, referral services and programs on current issues and needs challenging families in Southern Africa. Their trained, and caring staff are only a call away for those seeking advice. We also respond to letters, faxes and e-mails and offer a national counseling referral service. Due to the growing need and the demand for face-to-face counseling it has become necessary for Focus on the Family to establish an on-campus Counseling Centre to meet the needs of Christians and others both local and in the wider Durban area. Should you wish to make an appointment or need further information regarding this facility, kindly contact us. • GROWTHTRAC PRE-MARRIAGE MENTORING This is designed to give your marriage a solid advantage! It can help you to: • Develop skills • Align expectations • and Discover strength and growth areas. They also help you to • Build a support system • Identify tools and resources that could help you during this time in your relationship. • Marriagefriendlytherapists.com This web site can help you to find a well qualified marriage counselor who is marriage friendly. Many marriage counselors lack training and experience working with couples. Many couples experience marriage therapy as lukewarm in supporting life-long commitment. Keep in mind though, that Marriage Friendly Therapists are unrelated to any religious or political organization. You’ll find marriage counseling across the spectrum from secular to religious (or Christian). As you read through what they explain, we believe you will be able to better choose a marriage therapist in a wiser manner. • MARRIAGETEAM.ORG This is a Washington based, non-profit charity. It offers marriage coaching services for pre-marital and married couples. Their mission is to strengthen and save marriages. They work with a wide range of couples. From those couples seeking marital enrichment to those who have divorce papers in hand, marriage coaching has become the last ditch effort to save their marriage. The majority of coaching is done couple-to-couple in private homes. However, some coaches use Skype for long distance coaching. This has proven to be just as effective as coaching in-person coaching. All coaches are volunteers who are well trained in our unique program. • Meierclinics.com This counseling ministry has clinics coast-to-coast in California, Illinois, Kansas, Maryland, Michigan, Missouri, Pennsylvania, Texas, Virginia, and Washington, including major hub sites in the metropolitan areas of Chicago, Dallas, St Louis, and Washington, D.C. All of their clinic staff (psychiatrists, psychologists, social workers, marriage and family counselors, addiction counselors, dietitians, etc.) are committed Christians who are fully credentialed and professionally trained. They are dedicated to providing Christian counseling in a safe environment where men, women, and children can work through issues that are robbing them of satisfaction and enjoyment in life. The Meier Clinic in Wheaton, IL, is offering an Intensive Outpatient Program for adults dealing with sexual addiction. The clinics also offer Life Coaching, which can be done either at their clinics or on the phone. Go to their web site to find out more. • Narramore Christian Foundation and Missionary Psychological Services: Every year at least five thousand missionaries leave the field unnecessarily. This is because of excessive stress involving personal, family, social, and ministry-related problems. Those remaining on the filed face life stressors at least 2-3 times those experienced by individuals at home in the United States. The Narramore Christian Foundation is committed to serving these dedicated men and women, and their families. • 12CONVERSATIONS.COM is designed to help you learn more about developing a marriage mentoring program. Marriage mentoring can be as simple as finding a couple you respect and hearing their stories of married life. Also, if your church is looking for a mentoring program, this ministry is a good one to contact. • A Marriage 2 Die For! This is not a marriage help book. It’s a twenty-one day affordable marriage counseling program. It includes daily assignments, marriage building exercises, his and her journals, and supplemental audios. If the two of you are willing to commit to the process and stay the course, you will learn how to implement essential principals that will not only change your marriage but your lives. This is because God’s Word has the power to supernaturally succeed when everything else fails! And this entire program is 100% Bible-based. • Apples of Gold: A Six-Week Nurturing Program for Women is written by Betty Huizenga. It is published by Cook Communications. This program is designed for mature women to mentor younger married women through topical Bible studies based on Titus 2:3-5. It includes Bible study, and cooking demonstrations and then sharing a meal together. Plus there is encouragement to be the women God has called us to be. • Before “I Do”: Preparing for the Full Marriage Experience is written by Jason Krafsky. It is published by Turn the Tide Resource Group. This is an excellent Pre-marriage workbook which we HIGHLY recommend. It gives sound Biblical counsel and principles, and integrates proven relationship insights. Plus you learn relationship fundamentals to attain the skills to live the Full Marriage Experience. While the book is filled with useful information, it engages readers to interact with the material. It also can be used with a “Marriage Investor.” They can include clergy, small group leaders, marriage mentors, a seasoned married couple or counselor who acts as a pre-marital education facilitator. This is a GREAT resource! • Called Together…Asks difficult questions couples must answer before and after they say, “I do.” Steve Prokopchak wrote this book. It is published by Destiny Image Publications. This workbook is designed for couple-to-couple mentoring or personal use. It prepares couples for a successful, God-honoring marriage. It also addresses the challenges of remarriage, intercultural marriage and senior adult remarriage. Whether you’re considering marriage or remarriage or you counsel those who are, this book supplies down-to-earth advice and biblical wisdom. • 51 Creative Ideas for Marriage Mentors: Connecting Couples to Build Better Marriages This book, published by Zondervan, offers an “idea box” of activities. It also gives innovative ways to deepen relationships between mentoring couples. It can be used in any of the three areas of the marriage mentoring triad: • Preparing —mentoring engaged and newlywed couples • Maximizing —mentoring couples from good to great • Restoring —mentoring couples in distress. There is also an entire section of ideas appropriate for mentoring any couple. • Marriage Mentor Training Manual for Husbands: A Ten-Session Program for Equipping Marriage Mentors This book is designed by Drs Les and Leslie Parrott. They are two of today’s foremost marriage experts. It is published by Zondervan Publishing. This resource will train and equip you to help others weather the storms and build successful marriages. It’s a thorough, reassuring, and carefully designed approach for marriage mentoring. There is a companion manual for wives. • Marriage Mentor Training Manual for Wives: A Ten-Session Program for Equipping Marriage Mentors This book is designed by Drs Les and Leslie Parrott. They are two of today’s foremost marriage experts. It is published by Zondervan Publishing. This resource will train and equip you to help others weather the storms and build successful marriages. It’s a thorough, reassuring, and carefully designed approach for marriage mentoring. There is a companion manual for husbands. • The Complete Guide to Marriage Mentoring: Connecting Couples to Build Better Marriages In this book, which is published by Zondervan, Drs. Les and Leslie Parrott provide the complete guide to becoming a marriage mentor. They instruct the individuals who guide couples in many different stages of married life through emphasizing working as a team, building rapport, walking in another couple’s shoes, and praying together. This book contains practical guidelines help mentors and couples work together as a team. Appendixes offer a wealth of additional resources and tools. This guide also includes insights from interviews with church leaders and marriage mentors from around the country. • The Solution for Marriages: Mentoring a New Generation This book, is published by Today’s Promise. It is written by Jeff Murphy and Chuck Dettman. They show you God’s design for marriage and how successful marriage mentors and pastors are teaching couples to build awesome marriages. This guide combines timeless biblical wisdom, critical relationship skills, and empowering resources that have led many couples to a successful marriage. It’s designed for Marriage Mentors, Pastors and Counselors. It’s also for individual couples looking to improve their relationship or marriage. Plus, it’s also designed for those who are thinking about becoming a marriage mentor and for those who are presently mentoring. I am an unemployed husband and have been married for 17 years now and we have communication, transparency and trust problems in our marriage and this has already damaged our marriage affected and our kids so bad. I really do not know how to save and lead my family. Please help.